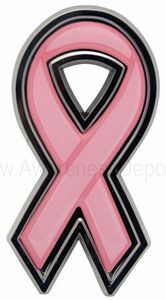 Pink Ribbon Chrome Emblem: The classy alternative to magnetic ribbons. -True chrome-plated metal finish; shiny chrome finish guaranteed to last lifetime of vehicle. Pink coloring is made from PVC in order to withstand any outdoor conditions and is guaranteed not to fade or bleed like cheaper imitations. Size: 1.625" x 3" x .125"